The report, "Cameras on the Battlefield: Multimedia Confirmation of the Razing of Gardud al Badry, South Kordofan, Sudan" includes before-and-after DigitalGlobe satellite imagery, frames from a newly discovered cell phone video shot by Abu Tira, and GPS-tagged ground photography of the destruction, provided to SSP by Nuba Reports, a Sudanese journalist organization. 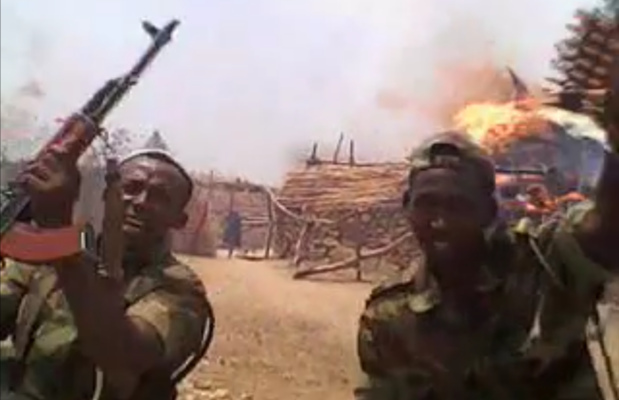 The cell phone video of the attack, which took place on May 18, 2012, was discovered by Nuba Reports. Two journalists then traveled one day by motorcycle and four days by foot to reach the remote village of Gardud al Badry, document its destruction, and interview eyewitnesses. There they met a young man, Naim, who is shown being detained and interrogated in the cell phone video. “Tie him down like a goat.” “Are you a rebel?” the interrogators demanded in between debating whether to kill him immediately or to get information from him first. Nuba Reports interviewed Naim about his subsequent 10-day detention and torture at the hands of Sudan government forces. Footage from his interview, as well as the original cell phone video, are in “Village Burning, Torture in the Nuba Mountains: Naim's Story,” a video co-produced by the Enough Project, SSP, and Nuba Reports. DigitalGlobe satellite imagery in the report shows the intentional burning of residential structures in the village, as well as the destruction of a school compound. The school was burned in the May 18 attacks, then eyewitnesses reported and imagery corroborates that Sudanese forces returned to shell the compound on July 29. We are seeing a repeat of Darfur without the international witnesses. Capturing the burning, razing, and looting of Gardud al Badry on video and in satellite imagery adds to mounting, and undeniable, visual evidence of a pattern of indiscriminate attacks and destruction by the government of Sudan against its own people. Through this campaign of targeted violence, which amounts to crimes against humanity, and its denial of humanitarian access, the government of Sudan is displacing thousands of civilians and contributing to insecurity in the region. All of the full-resolution imagery from the report—satellite imagery, photographs, and video frames—are free for download on the Enough Project’s Flickr account. Read the report: "Cameras on the Battlefield: Multimedia Confirmation of the Razing of Gardud al Badry, South Kordofan, Sudan"